Sifting through Pinterest, I stumbled on Giles Tran’s 3D concept art, “Main Street East”, an eye-catching, imaginative view of urban gridlock. 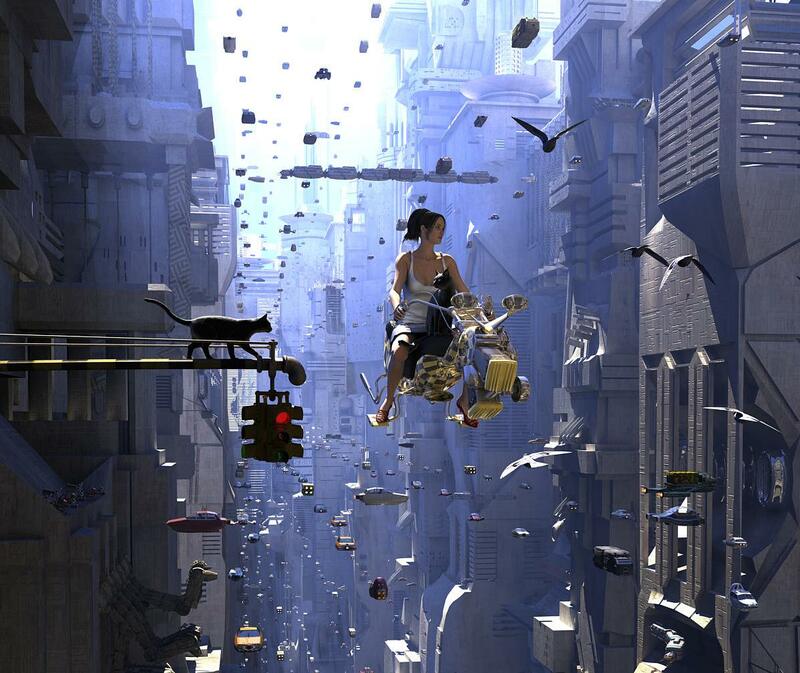 The pinner posed a question; “Could this be the future of city travel?” A cat sits in the lap of a scooter girl as she waits out a red light, hundreds of feet in the air. Traffic flows at multiple levels, like a three dimensional ant farm. It’s something right out of the sixties cartoon classic, The Jetsons. I love the birds weaving in and out of traffic. No shortage of movies with great traffic scenes (Blade Runner, I Robot), but one of my favorite movies, The Fifth Element, has the most awesome car chase with Bruce Willis diving through congested traffic to shake the cops on his tail. My sci-fi imagination wants to be a passenger in that taxi. Too many years in corporate operations, red-carded it as comic book fantasy. In Tran’s illustration above, the girl is in shorts, sandals, no protective helmet, and has rearview mirrors mounted on handlebars. It’s a fun scene, sure caught my eye, but even Star Wars hovercraft used seatbelts. And how does that cat stay in her lap? Yeah, I know, let’s hear a rousing “boo-hiss” for the reality flag. It’s science “fiction”, not science fact. We’re supposed to suspend the laws of physics. Great space operas put good use to creative license when it comes to science. Hell, if we let Einstein, Newton, and Hawkings critique sci-fi stories, we’d never get out of the solar system (and some highly-educated folks question if we ever will). The tech didn’t leave my scene in the break-down lane, the human factor did. Too many people already drive like maniacs in today’s world, and it’s only two-dimensional. Imagine heavy traffic in the 22nd century, vehicles streaming along multiple altitudes like blood cells through tightly bundled capillaries. Fender bender takes on a whole new level. Disabled vehicles don’t roll off the road, they turn into lethal meteorites. So, how did I escape from my self-induced, reality prison, and solve the flying hovercraft dilemma of my new WIP? I kept it simple. Manual piloting outside a major metropolis is fine. Within a congested city, I took a cue from the movie Minority Report, and had all commercial and personal flying vehicles relinquish control to a city grid, facilitated by artificial intelligence. Satisfies elements of the reality killjoy, yet still leaves room for a Bruce Willis character to hotwire off the grid and turn his craft into a get-away jet. Better yet, makes a good setup for a malicious plot by outsiders, or the AI itself, scrambling the grid and turn the city into a 3D demolition derby. No scooter girls with cats in their lap, and certainly no old world stoplights outside 146th floor of a high-rise building. What’s your thought? Am I letting the responsible skeptic take all the fun out of it? If you like this post, show the love by liking it back, and feel free to share your concept of futuristic city transit by commenting. Armed with new age graphic software, artists are creating concept art of stunning detail and originality. Check some of it out at any one of the artist networking sites, or browse through an amazing array of images posted on Google. Google and Pinterest are great places to browse for ideas, but images often come from postings without attribution or links to the artist. I prefer to use artist network sites (like DeviantArt), royalty-free stock sites (Like DepositPhotos, Flickr), or creative commons, as it links directly to the artist and comes with info needed for attribution. Most are free, or available for a small fee. If unsure, always contact the artist for permission. You might be surprised how open-minded artists are to share their work with proper attribution. You have an interesting blog with intriguing posts. I tried to comment on the post combining food with literature, but comments were closed. In general, I like dystopian literature and am a Jeff Bullas fan. Thank you for visiting my site yesterday. I am glad you liked my Pinterest post “How to blow the roof off…”. Nice to meet you. Thanks, Janice. I try to keep the content relevant to whatever I’m writing at the time. I look forward to future posts from you.